In early November 2017, ACYPL sent a delegation of six young leaders to South Africa and Botswana on a two-week political exchange. In South Africa, ACYPL connected with a new program partner, Lead Afrika, and reunited with the Organization for Youth and Elections in Botswana (OYBEO) for the second time. The delegation was comprised of elected officials at the state and local levels, a member of the staff of the Democratic Congressional Campaign Committee, and a legislative director for a US governor. This group sought to uncover the differences between these two democratic countries while exploring the unique heritage and culture of sub-Saharan Africa. Following a day of pre-departure briefings in Washington, DC, the delegation began their exchange in Pretoria, South Africa. Notable highlights included discussions with the National Spokesperson of the Democratic Alliance, who provided context and a foundation for the South African political landscape, and the Mayor of Midvaal, who spoke at length about local politics. In Cape Town, the group spent a day at the Parliament of South Africa, enjoying dialogues with South Africa’s many political parties, including the Democratic Alliance, the Inkatha Freedom Party, and the United Democratic Party. 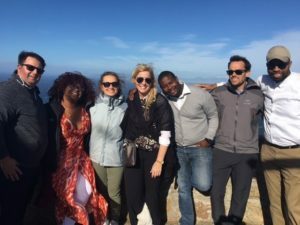 Outside of formal meetings, the delegates visited Nelson Mandela’s House in Soweto, saw a penguin colony at Boulders Beach, and took in breathtaking views of Cape Point. After concluding several interesting days in South Africa, the delegation traveled to Botswana. In Gaborone, the delegation observed the role that tribal affiliation plays in Botswanan politics by attending a village town hall meeting, known as a Kgotla. Accompanying the group was the US Ambassador to Botswana, Earl Miller, who explained the tribal remarks in real-time. Another highlight was a lunch meeting with Ms. T. Seretse, the former Botswanan Ambassador to the US. Both opportunities offered a candid diplomatic perspective into the US-Botswanan relationship and local customs. Traveling on to Kasane, Botswana, the delegation met with local officials in the Chobe District and set sail on a wildlife boat cruise along the Chobe River before returning home.